When I create some shape, only using fill and no stroke, I get gaps between the different parts of the model. When I create these shapes I make sure that everything only snaps to grid, but the shapes still don't seem perfectly aligned. I'm guessing it's an issue with my understanding of vector graphics or there is some setting to avoid these gaps. I attached a screenshot for reference. What is the solution for this? What am I not getting right? That's the light background bleeding through the edges of the shapes due to the antialiasing (smoothing out the "step" effects you see around objects like circles,diagonals etc). 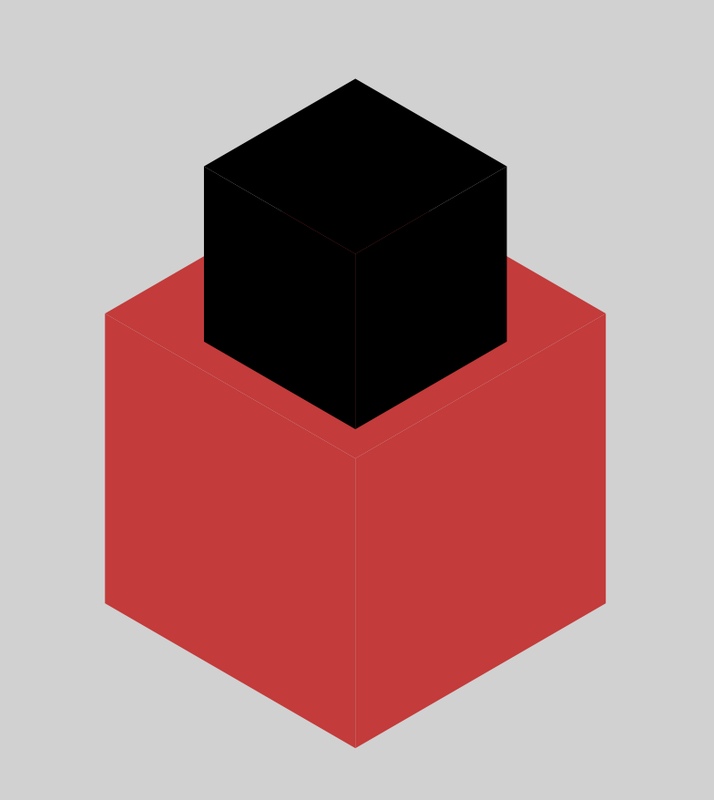 In a case like yours you can combine all three red shapes into a single object eliminating the gaps between them selecting all and using an Add boolean operation. You can keep the original shapes editable if you perform a non-destructive Add operation pressing and holding ⌥ (option/alt) while clicking the Add icon in the Operations section area in the Persona Toolbar (see screenshot). This will result in a compound shape that you can expand in the Layers panel to access and edit the original shapes. Aaaah... Thanks a lot for the explanation. I hadn't thought of that (antialiasing) but it makes perfect sense. I also hadn't thought of creating a compound instead of combining/merging them, as they didn't technically overlap. Thanks do much. Very helpful :). I hope to be spending more time here at the forum. It seems to be a great community :). 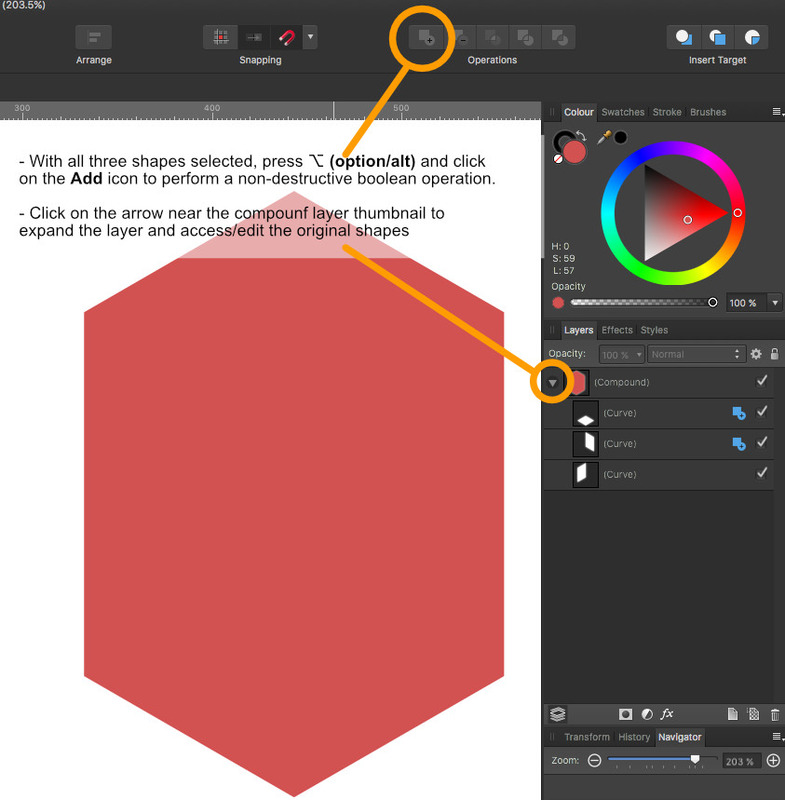 Please also make sure you have Use Precise Clipping checked in Affinity Designer Preferences, Performance tab, as this also may help solve those issues in some circumstances. When i go to sub edit i am not able to change the shapes colours independently so it goes against what i want to create. I also enabled precise clipping and re started AD but not much difference. For cases where you wish to keep the objects separate (to be able to fill them with different colours) you can't use a boolean operation. Compound object don't support different fill colours as you discovered. One way to work around this is to create a new object with the same colour of one of the original objects and place it behind them to hide the gaps. A stroke with the same colour as the fill may also help to solve some situations. In Illustrator a quick fix for this problem is select all objects then Object > Path > Offset Path to offset all the objects to fx 0.1mm. Another argument for offset path in Designer.